M/V St. Sealthiel of the SuperCat line owned by 2Go Shipping crashed into the docking area of Pier 1 in Cebu City early Tuesday morning. The accident wounded 18 passengers and three crew members. A call center agent and his wife were allegedly threatened when a taxi driver flashed a knife at them and shouted curses when they asked for a P10 discount as mandated by the Land Transportation Franchising and Regulatory Board (LTFRB). Are you thinking of buying a house? How about getting one in Argao? M/V St. Sealthiel, coming from Tagbilaran City, was maneuvering toward its berth at 8:25 a.m. when it rammed the pier in Cebu City. Many of the 130 passengers, who were already standing before the ferry could dock, were thrown by the impact. A “maneuvering control failure” was cited as the cause of the accident. At least 21 persons were wounded and were rushed to Chong Hua Hospital in Cebu City. 2Go Shipping will shoulder all the needed medical expenses. Capt. 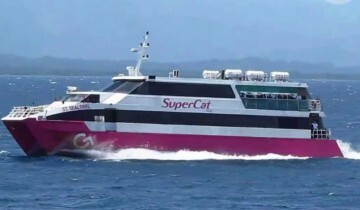 Lyndon Landoy, assistant vice president for operations of SuperCat said that fewer passengers would have been injured if they had stayed in their seats until the vessel had safely docked. He assured that the incident is an isolated one. Irked for being asked for the LTFRB-ordered P10 discount on the flagdown rate, Joel Ramos of SD Taxi allegedly pointed a knife at Dave Seyjorca who was with his wife. This prompted Seyjorca to file a complaint at the LTFRB 7. SD Taxi is owned by operator Sinforiano Doncillo of Barangay Cambinocot, Cebu City. Doncillo and Ramos were summoned by LTFRB 7 for a hearing on March 12. The incident took place on the first day of the implementation of a nationwide rollback of the taxi flag down rate from P40 to P30 due to lower fuel prices.